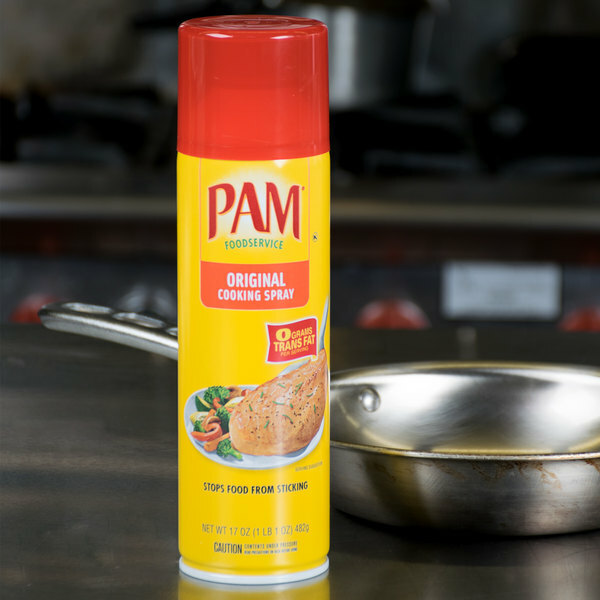 Tackle a variety of cooking tasks with this PAM 17 oz. original release spray! It creates a non-stick coating on a variety of surfaces, including grills, casserole dishes, and fry pans. It's made with a blend of canola oil, palm oil, and coconut oil to handle high heat and ensure that your foods won't stick to the pan. 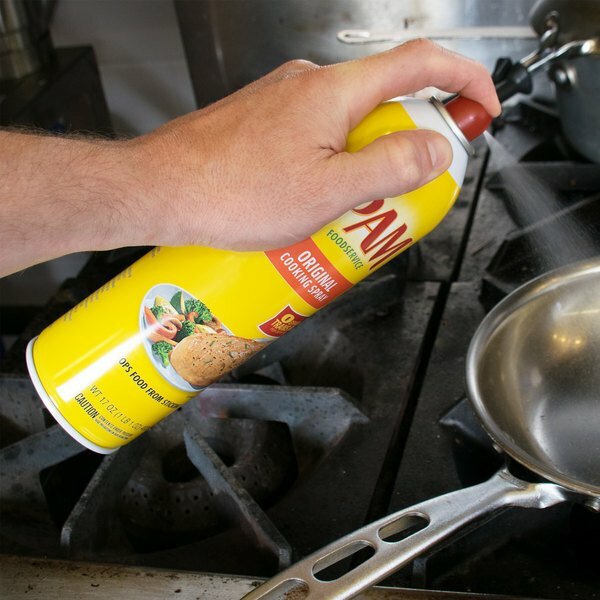 To use, simply shake this aerosol can and spray a light coating onto the pan or other cooking surface to create a surface from which foods will release easily. Eliminate labor time, avoid applying too much or too little grease, and enjoy a more consistent taste with this original release spray. PAM is a well-known name that has been helping cooks save time in the kitchen since 1961. 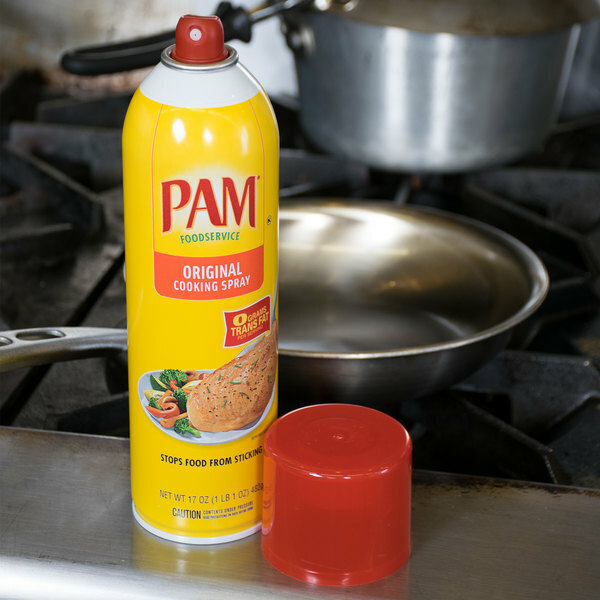 PAM sprays help reduce the amount of residue left in the pan so you can also clean up faster. Not only can you avoid gummy build-up that occurs with other greases and oils, but you can also extend the life of your pans and lessen replacement pan costs. I have been using this product for years. 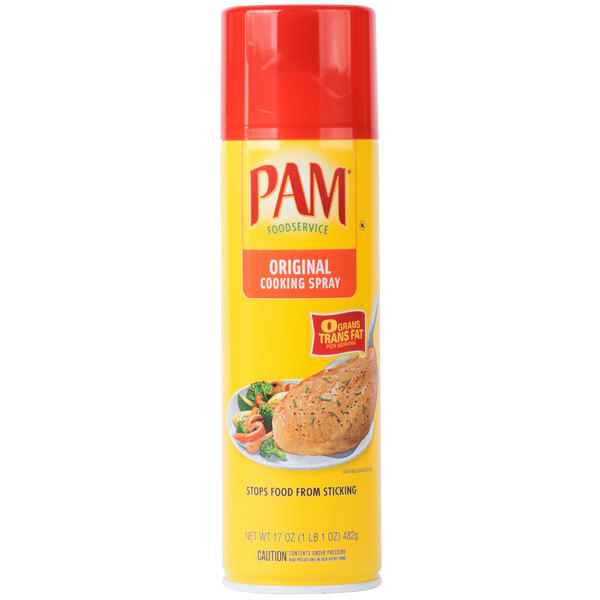 PAM is a great cooking spray. It's great at keeping food from sticking and makes clean up so easy. I highly recommend this product. I have been using PAM for years. It has always worked really well for me, never any complaints. It does its job and it does it well. 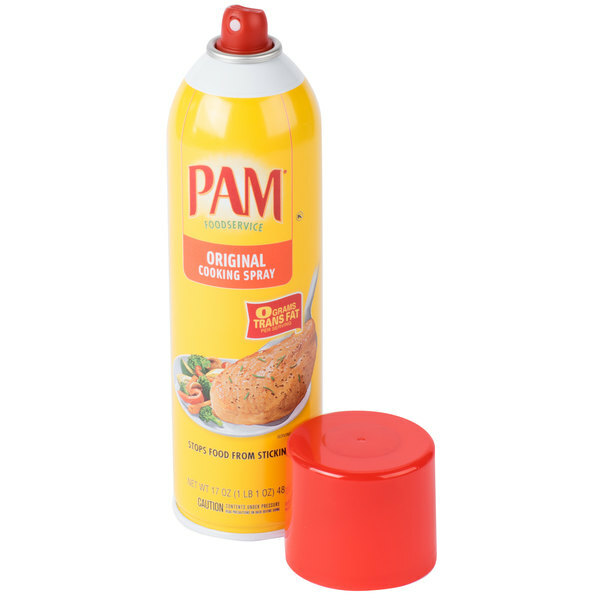 We love our PAM spray at our sweets shop and use it spray baking pans and fudge sheets. Also works great for spraying on our surface while rolling out pie dough. Love this product! Pam is an oil based formula and I cook a lot as well as bake for customers. Pam is a lifesaver because nothing sticks to the pan! This is priced right and a must have item in our kitchen. Comes six to a case and lasts a long time. Would recommend for sure. PAM is so amazing and we spray everything before cooking. Love the ease the finished product just glides off the pan. No more stuck muffins. 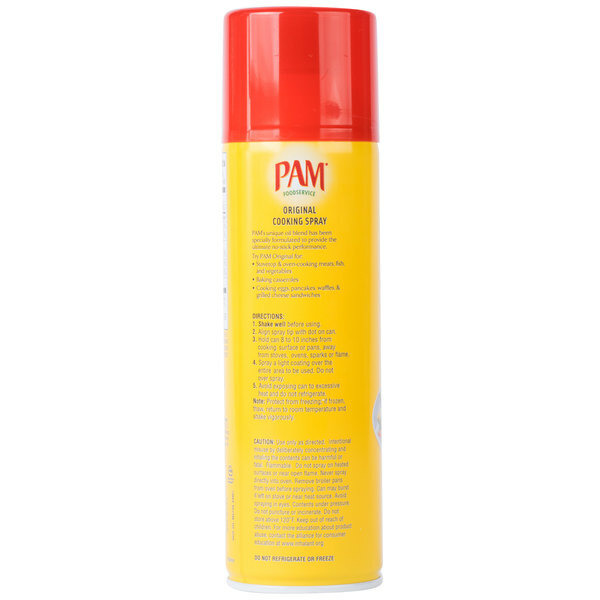 PAM original is the only spray we use at home. The spray is great for all cooking methods and the spray is such a great quality. No sticky no matter what we cook. this is such a great handy oil spray that works on most pans and for many different foods. 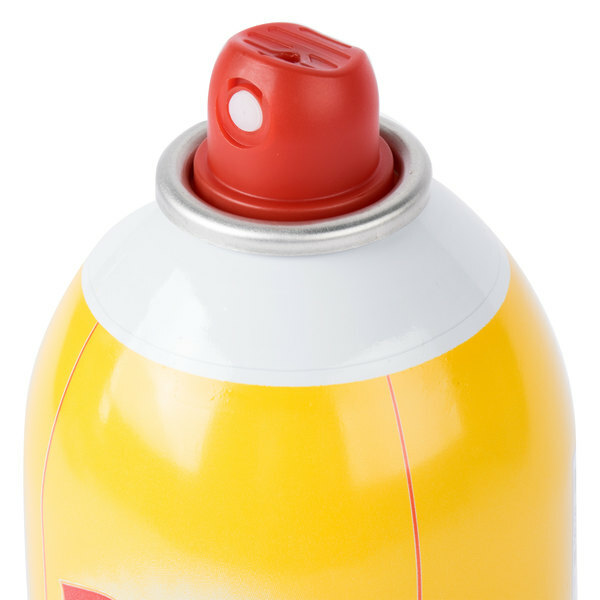 It sprays evenly and is a good size for a large family or restaurant or business. PAM is such an awesome brand! Love using this product when i cook. It makes my cleanup so much easier and the food always comes right off the pan. The original release spray is a great all around spray that is perfect for all your baking and cooking needs. A nice coating oil that is not greasy. I have used PAM for years and the original spray can not be beat. I love buying it by the case and it always arrives on time. I love this item and keep plenty in my pantry. Everyone knows and loves PAM original release cooking spray. It is the ideal cooking tool and is perfect for any kind of cooking in your restaurant. Before I discovered parchment paper I loved using Pam to grease my baking sheets. I'll still use it on occasion to grease baking dishes for things like brownies. PAM Original is famous . I remember using Pam when I was just a kid twenty years ago to make pancakes Saturday mornings . The price is not too much different . We use pam everyday in our bakery. Nothing ever sticks! It works GREAT! We will definitely be buying it again. And shipping was so fast! I love Pam. Before I knew about parchment paper I'd always spray my baking sheets with this and my food released cleanly from the pan. Now I like to use it to spray my cake pans before I flour them. In our bakery we used this to spray the surface of our jumbo muffin tins so that the overflow wouldn't stick to the pan. It worked like a charm. this is the classic, old school pan spray that i think most people grew up with. my mom used it and i still use it because its a tried and true product. 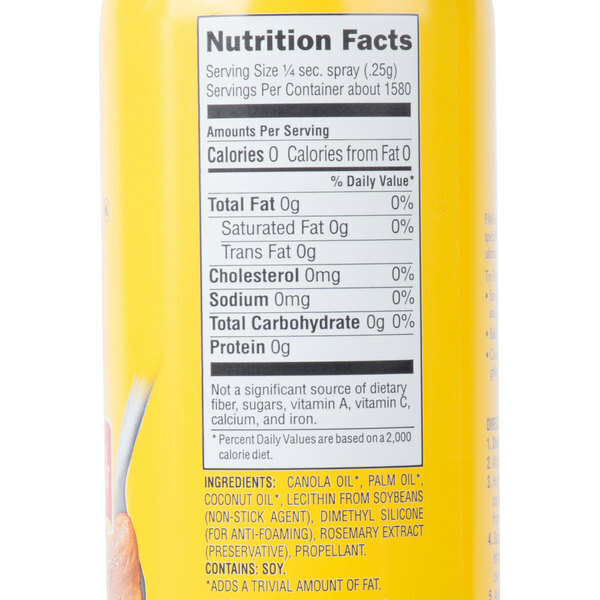 it prevents sticking and helps you cut calories from excess oils and fat. I bake mini donuts every day in my bake shop and the tiny cavities on my donut pans need a good spray of oil to help the donuts pop right out. Pam is a great product and my go to brand. It really is a great release spray! This PAM product is ok. I think we use if far less now that there are a number of other options out there for specialized applications. It does still work, but we only really use it in the frying pan, and not for baking or grilling anymore. Its always a good product, but there are others out there we recommend in the PAM line up more. 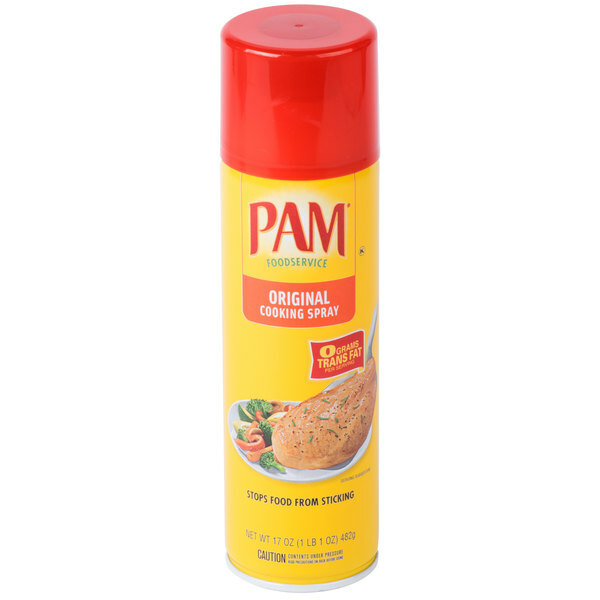 If you have ever tried a store brand cooking spray you know why Pam is that muh more expensive. Negligible taste in your cooking and baking, and makes cleanup of pans and pots so much easier without the sticky mess! Save Up To $11.17 with our Recommended Product! 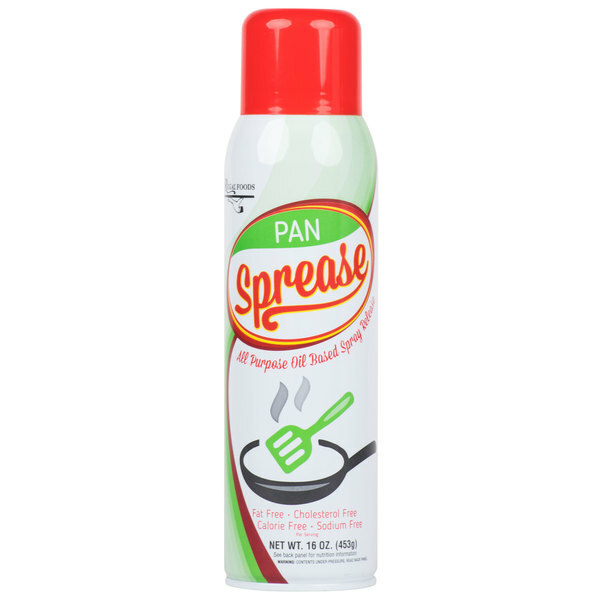 Stock your restaurant or bakery with Pan Sprease 16 oz. all purpose release spray and save costs! This easy-to-use aerosol can provides excellent non-stick performance and is available at a cheaper price.